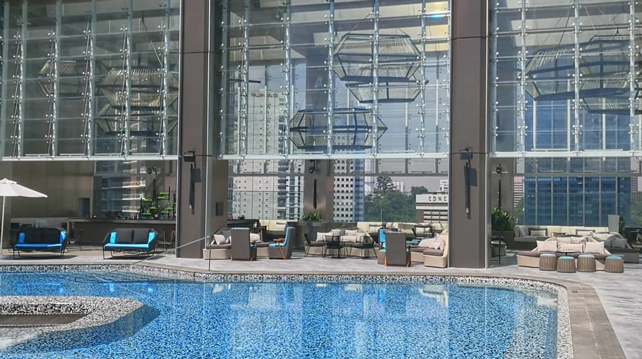 Morning coffee, light lunches, afternoon tea or a casual catch up session over wine is best done with a view and that's what Banyan Tree KL is offering. The space is a high-ceiling hall outfitted with warm wood panelling, comfy armchairs and huge windows to take in the view of the city. The afternoon tea set also features some inventive savoury bites alongside the typical selection of eclairs and macarons. Address: Level 53, Banyan Tree Kuala Lumpur, Jalan Conlay, 50450 Kuala Lumpur, Malaysia. Horizon Grill may not be a rooftop destination but it has an alfresco dining area that overlooks the same view you get while at Vertigo (which is right above Horizon Grill). 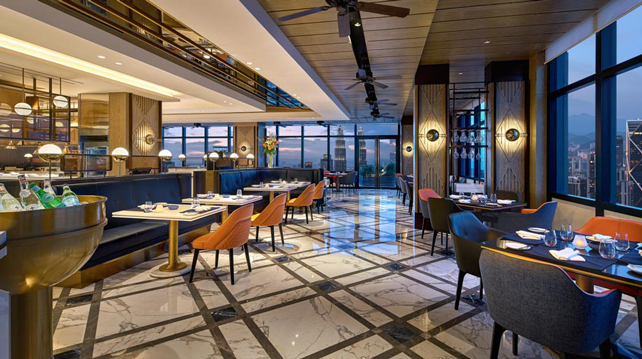 Your S/O would be impressed by its selection of fresh seafood and premium steaks as well as how easy it is to get after-dinner drinks just upstairs. Address: Level 58, Banyan Tree Kuala Lumpur, Jalan Conlay, 50450 Kuala Lumpur, Malaysia. Operation Time: Opens for breakfast, lunch and dinner daily. Located right next to Hotel Stripes Kualal Lumpur, Joloko is the place to be when you want a fun night out with your girls or a chill catch up session with your pals. Its bright tiles and colourful prints will transport you to a beachside hangout spot while its menu, featuring Caribbean-style dishes, will put you in a food coma. Joloko’s cocktails are not to be missed but make sure to try out their Mezcals and their biodynamic wines too. Need an excuse to pop by? Joloko throws some pretty awesome parties every other week. Just keep up on Facebook. Address: 43, Jalan Kamunting, Off Dang Wangi, Chow Kit, 50300 Kuala Lumpur, Malaysia. This new bar is made out of all our psychedelic dreams. A glance up at the ceiling and walls will tell you why - the former is peppered with LED lights that resemble the night sky while the walls are decorated with psychedelic motifs, floral prints, and the ceiling is On its extensive drinks menu, they have cocktails, whisky, vodka, gin, rum, tequila, mezcal, cognac, Tuak, wines, beers, ciders as well as champagne. The food’s not bad too! Address: 50 Jalan Maarof, Bangsar 59100 Kuala Lumpur, Malaysia. 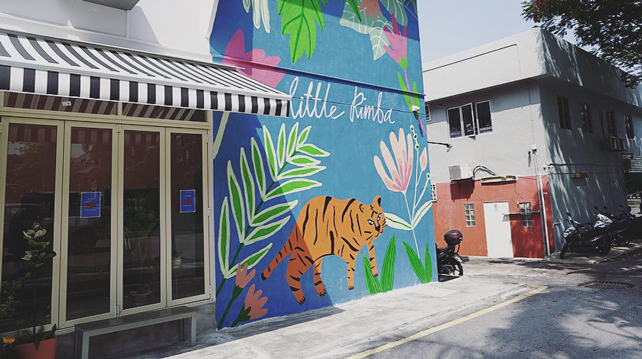 As you can guess, Little Rimba is opened by the founders of Rimba & Rusa. 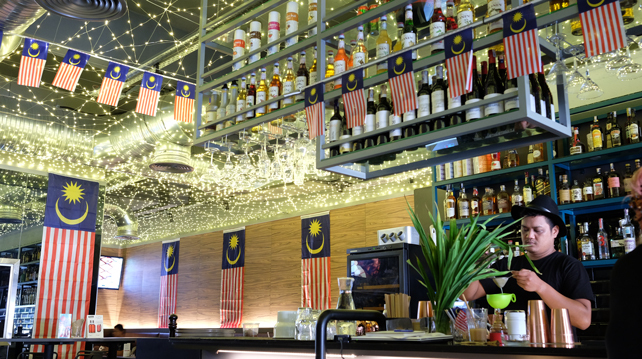 It's a comfortable, cosy place that serves up a mixture of Western and Malaysian delights. There's toasted bagels, spaghetti, and French toast for those who prefer a foreign touch. Then there's Lontong, Nyonya Laksa, Soto Ayam, Nasi Lemak Cinta Ayam Goreng Berempah, Cendol Nangka and the classic Ais Kacang if you want a local palate. Drinks include crowd favourites like Sirap Bandung and Lychee Ais. Address: 1, Lorong Datuk Sulaiman 7, Taman Tun Dr Ismail, 60000 Kuala Lumpur, Malaysia. You can never have too many bars in Kuala Lumpur. 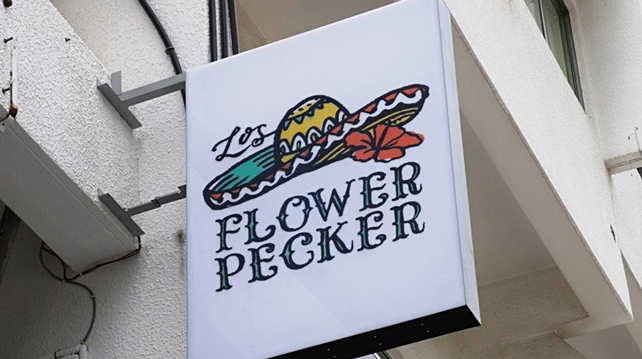 Los Flowerpecker is Uptown's latest watering hole and it offers a selection of simple but refreshing cocktails at affordable prices. And by affordable, we mean drinks are below RM50. The drinks here reflect Los Flowerpecker's no fuss, no muss vibes and the cocktails are vermouth-focused. Address: 10M, Jalan SS 21/58, Damansara Utama, 47400 Petaling Jaya, Selangor, Malaysia. 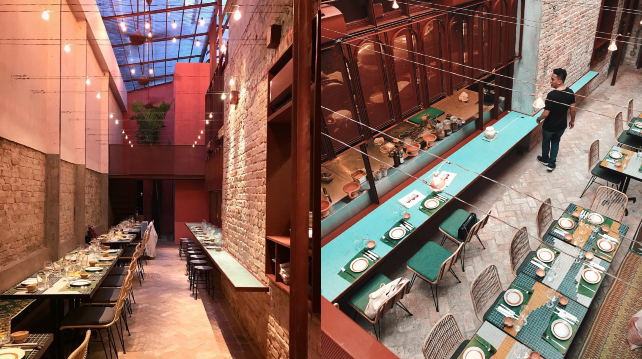 Masale Twist's menu was inspired by founder Fay D'Cruz's hometown in India, Mangalore. 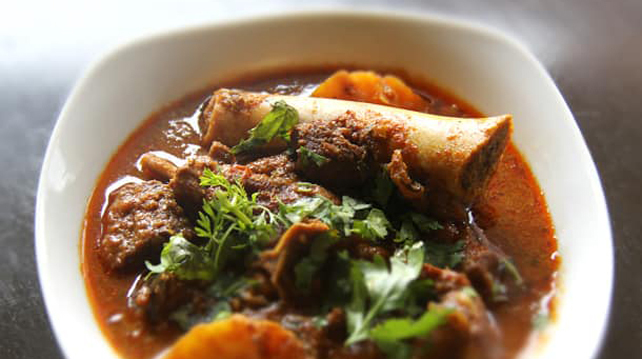 The place offers your typical Indian fare like tasty ghee-cooked dishes, naan, curry, fried vegetables and more. The new eatery also serves white or red wine to go with your spices. Address: 33, Jalan SS 21/56b, Damansara Utama, 47400 Petaling Jaya, Selangor, Malaysia. The newly opened Swimming Club has everything you’d need on a staycation. A saltwater infinity pool, a poolside bar, great cocktails and a DJ on the deck spinning your favourite tunes. It’s an ideal spot for parties as well as its played host to plenty since its unofficial opening in July. There’s also a 1-for-1 cocktail promotion from 4pm to 7pm daily so don’t miss out! Address: Level 11, The Kuala Lumpur Journal, No. 30 Jalan Beremi, Off Jalan Sultan Ismail, 50200 Kuala Lumpur, Malaysia. Picture this: a magnificent view of the Twin Towers, Tiki cocktail in hand and a cool breeze playing across your face. That's exactly what you'll get at Wet Bar. 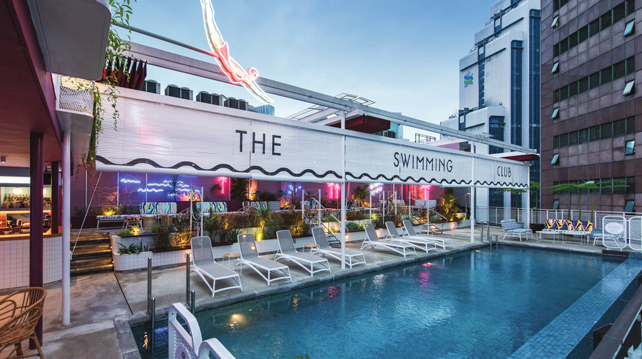 The bar is located at the pool deck which turns into a party place with DJs in the evenings. You'll find the drinks menu featuring plenty of local ingredients as its inspired by Malaysian culture. Address: W Kuala Lumpur, 121 Jalan Ampang, 50450 Kuala Lumpur, Malaysia.